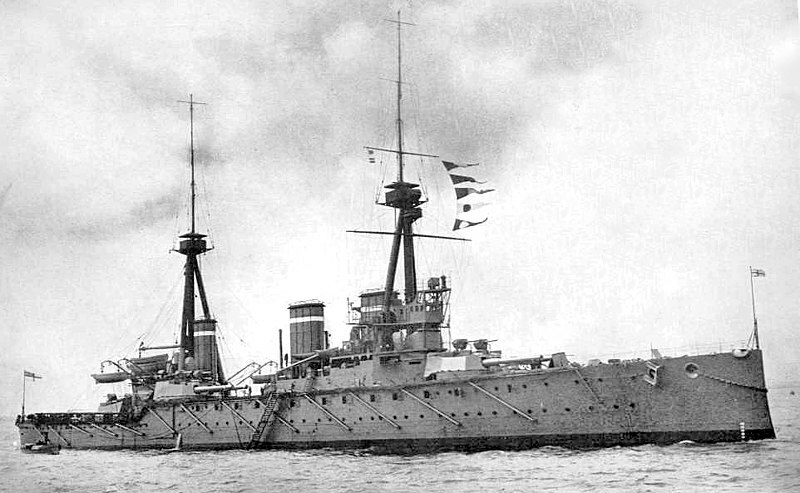 The battlecruiser is perhaps the most misunderstood and maligned warship in history. Conventional wisdom states that they were the result of Jackie Fisher’s bizarre belief that “speed is armor” and that they were ultimately a mistake, as evidenced by the loss of three at Jutland and Hood'⁣s death against Bismarck⁣. In fact, the term battlecruiser applies to at least three different types of ship, which filled critical roles in the fleets of a century ago. The battlecrusier has its origins in the large armored cruisers of the late 19th century. These were approximately the same size as contemporary battleships, trading guns and armor for speed and range. They were intended for trade protection, commerce raiding or working with the battlefleet, depending on doctrine. Krupp armor allowed them be armored effectively against 6″ QF guns, which meant that they were often proposed as a fast wing of the battlefleet. Their armament bore this out. They had a few guns of 8″-10″, and an armament of 6″ QF guns nearly equal to that of contemporary battleships.1 The US Navy, after the Spanish-American war, built 10 large armored cruisers and gave them state names, a convention reserved by law for battleships, in recognition of their status and importance. The Royal Navy agreed, classifying them as battleships. It was generally recognized that the armored cruiser and battleship would eventually merge into a fast capital ship. This posed a serious problem for the British. As the power most dependent on worldwide trade, they decided they needed a 2:1 ratio in armored cruisers over the largest other naval powers (and their likely rivals), France and Russia. But a ship as big as a battleship costs as much as a battleship, and the Boer War was a serious drain on the Exchequer. To stop the bleeding, Jackie Fisher was installed as First Sea Lord, the professional head of the Royal Navy. His plan to reduce the number of ships required to protect British trade had two parts. First, he would revolutionize how his forces were used. Instead of dispatching ships to search for raiders on their own, raiders would instead be tracked using information gathered from a wide variety of sources2 and analyzed centrally, and ships would then be routed to intercept via radio. Of course, sacrifices in armor were necessary to keep the ship's size under control, and the first battlecruisers were no more heavily armored than the last armored cruisers. It was believed that by staying at long range and using their speed to throw off the enemy's fire control, Fisher's dictum of "speed is armor" would actually prove true. Fisher also argued that they were unlikely to fight enemies directly on the broadside, and that the increased angle of incidence on the belt would increase its effectiveness dramatically. Oddly, neither he nor anyone else seemed to have considered what would happen when other nations began building similar ships. As a sign of how seriously the raider threat was taken, the 1905-1906 program contained only one battleship, Dreadnought, but three battlecruisers4 of the Invincible class. This is often overlooked because Dreadnought entered service much earlier, but it shows Fisher's real priorities. The resulting ships were the same displacement as Dreadnought, although the need for high speed meant that they were 40' longer. They were armed with 4 twin 12" turrets, one forward, one aft, and two amidships, staggered to give at least a theoretical capability to fire 4 guns ahead and an 8-gun broadside. In practice, neither capability worked very well due to blast interference, although it remained an option in battle. The 6" armor belt was a major step down from Dreadnought’s mix of 11" and 8" belt armor, and the deck armor was slightly reduced, too. At the time, battle ranges were still relatively short, and recent improvements in guns and shells, particularly the development of the AP cap, had made it impossible to armor a ship against AP projectiles. Over the next decade, increasing battle ranges made armor a practical choice again, leaving the early battlecruisers very vulnerable. The Invincibles were also fitted with 4" secondary guns, instead of the 12 pdr (3") guns of Dreadnought, a reflection of the growing size and toughness of destroyers. On the other side of the North Sea, the Germans responded by laying down battlecruisers of their own, starting in 1908.6 The first of these, SMS Von der Tann, was slightly larger than Invincible, and the result of a very different set of tradeoffs. The Germans could not afford to build enough ships to match the British, and decided to prioritize armor over guns to allow their battlecruisers to fully stand in the line of battle with the battleships. Von der Tann's armament was laid out much like that of Invincible, but she was armed with 11" guns instead of 12" weapons. She also had 10 5.9" guns, intended as secondary weapons in a fleet battle.7 Her belt at its thickest was 9.8", less than an inch thinner than the belt of the contemporary Nassau class battleships. She was also considerably faster than the Invincibles, making 27.8 kts on trials, although in service her performance was limited by low-quality coal. 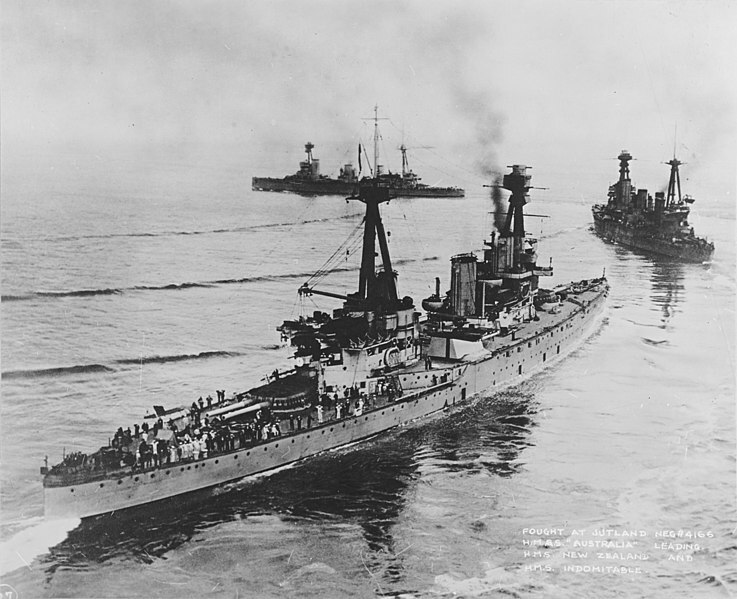 After the 1905-1906 program, the British built no battlecruisers under the next two programs, due largely to Fisher's inability to communicate his vision. 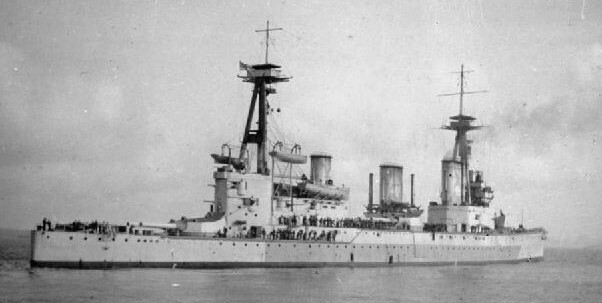 In 1908, it was planned to order two mini-battlecruisers, essentially a reduced Invincible with 8 9.2" guns. However, the discovery of the second German battlecruiser meant that a half-sister of the earlier ship was ordered instead. 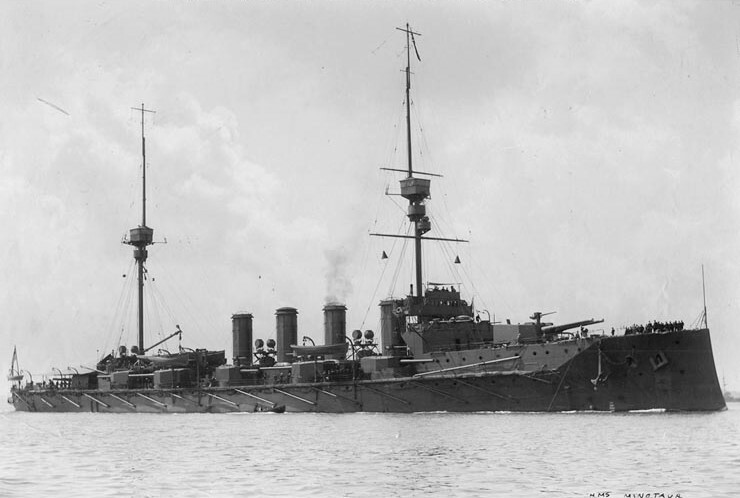 The major difference between Indefatigable and Invincible was the greater fore-and-aft separation between the two midships turrets, to give them wider arcs of fire across the ship. Indefatigable was followed by two more ships, HMAS Australia and HMS New Zealand. Australia was bought as part of Fisher's attempt to build naval forces among the Dominions9 and was owned by the Australian government. These forces, each centered around a battlecruiser, would have fulfilled the anti-raider mission around the world while the British fleet concentrated in European waters. 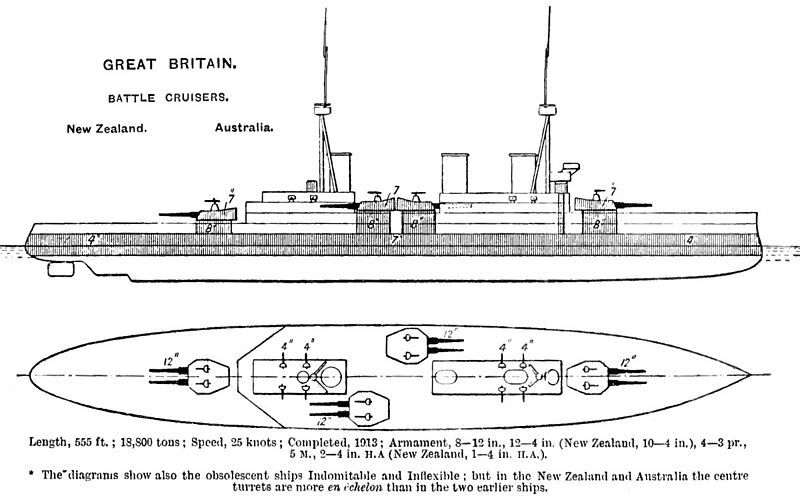 No other Dominion bought ships, but the government of New Zealand gifted a battlecruiser to the British. The second class of German battlecruiser was slightly more of an improvement on its predecessor than the Indefatigable was over Invincible. The extra 3,600 tons allotted was used to buy an extra 11" twin turret, superfiring aft,10 an extra pair of 5.9" guns, and slightly improved armor. 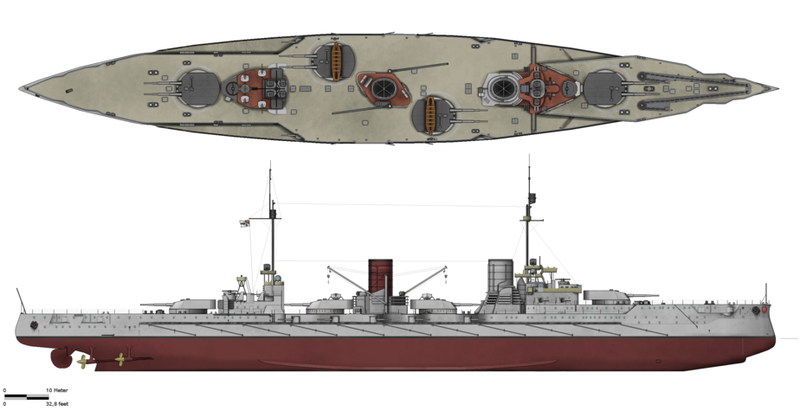 Two ships of the Moltke class were built, the name ship and the Goeben, later famous for her part in bringing Turkey into the war. 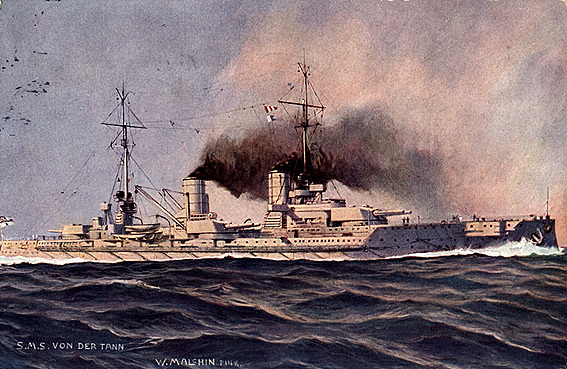 The last of the early German battlecruisers, Seydlitz, was a minor improvement on the Moltke. Another inch of belt and a knot of speed were added, but the armament remained the same. Next time I return to battlecruisers, I'll look at the later and more heavily armed battlecruisers: British, German, and Japanese. Wait, the Lion class doesn't count as an early BC? My dividing line was when caliber began to escalate, and Lion had 13.5″ guns. There was also a substantial jump in armor, and a change in armament layout. The Germans had a break at about the same point in time, so I split it there. The later-model German 11-inch guns (specifically the L/45 and L/50 models) had a higher muzzle velocity than the British 12-inch Mk X guns and Mk XI guns (855 vs 823 m/s for the L/45 vs Mk X, and 880 vs 861 for the L/50 vs Mk XI and Mk XII), which German naval planners considered to make up for the smaller shells. This may have been compounded by Germans comparing their latest guns to the previous generation of British guns, since German shipyards took considerably longer to build battleships than the British did. I suspect a large investment in tooling for manufacturing 11-inch guns was a factor as well, since those were used in several generations of German BBs and BCs, and the German Army also used the same caliber for several railway gun models. Note, though, that the Germans went for 12″ on their battleships at about the point Moltke was built. I think some of it was Tirpitz trying to hold down the size of his ships because of the way his budgeting was structured (long story, and one I will tell eventually), but there’s some of it I haven’t put in the time or effort to understand. Yes, the German guns were better than their British counterparts (and I’ve actually just finished writing about this in the context of main guns) but there were other things going on. For instance, the Germans never had an intermediate gun between 12″ and 15″, and they went to 15″ before they found out about the British decision to do so. On the other hand, the German battlecruisers were almost always an inch or so down on their contemporary battleships in terms of guns. They went for 15" on the Bayern class, and 14" on the Mackensen class. This is not a decision I would have made (logistical reasons, if nothing else), but it does sort of fit with traditional German defense procurement. See most of WWII. I'm sure Tirpitz was constrained in his designs by the German Naval Laws, but another part of the decision to stick with smaller guns was the Kiel Canal. There was a project underway to enlarge the canal to accommodate dreadnought-type battleships, which completed in 1914, but that project was based on the footprint of early dreadnought designs. The larger ships designed around 15" guns were too big for the enlarged canal, and Tirpitz was reluctant to bite the bullet and accept building bigger ships that would require a second canal-enlarging project in order to be able to pass between the Baltic and the North Sea without passing through Danish or Swedish water. I checked Fighting the Great War at Sea, and Friedman attributes most of it to Tirpitz being trapped by the Navy Laws, which specified both ship numbers and ship cost. He couldn't simply say "we'll order three instead of four ships, and make each ship bigger", because they'd be written for pre-dreads. This resulted in lots of budgetary games, and things like heavily cutting the training ammo budget. The Kiel Canal isn't mentioned except in connection with the Nassaus. But I'm not an expert in the German navy. I've noticed a lot of people tend to obsess over (a) gun caliber and (b) armor, whether the concept is tanks or battleships, but it seems to me that sensors/fire control (and the training to make proper use of it) is a huge issue that gets very little love, mostly because it's complicated to properly understand. But fire control makes for big differences (e.g., Renown vs. Scharnhorst/Gneisanu off Norway where the German BCs' shooting just got worse and worse during the fight). Ammo design, too -- the British probably would have won Jutland in a big way if their shells had actually exploded upon hitting at the rate they were supposed to. Shells are actually complicated and powerful mechanisms for making things go boom, and there are lots and lots of ways for them to not work (admittedly a 16" AP shell can still wreck your day because it punches a hole a foot and a half wide through your ship even if it doesn't explode), but dud percentages are high enough to be noticeable even in WW II (e.g., the 15" shell from Bismarck that found its way into Prince of Wales' bottom spaces; had it exploded near the magazines, well, ouch). I’m certainly not unaware of those issues, and there’s a reason that Naval Gazing started with a discussion of fire control, and that I harp on it at every opportunity. My favorite thing to do on the Iowa was to ambush guests and talk about fire control. It’s a topic I do intend to get back to, but not until I’ve gotten the other basic technical topics updated. I’m working on main guns now, which more or less finishes the major topics, so expect that in the next couple months. WRT this specific instance, for a variety of reasons, big guns are better than small ones, and I do think that I’d have looked very very hard at going to 8x12″ over 10x11″. I don’t have the precise numbers to know what would have happened, but at the very least, it means you’re using the same guns and ammo as the battleships. I'm somehow completely unsurprised by this. I still can't quite make up my mind of Fisher. He was clearly a genius, but also unstable. For every very good idea, he also had a bad one. One of these days, I'm going to write a post on him, so I can link to it instead of wiki.